Index cards and pencils placed in the middle of table, quiet tapping out of syllables all around and more naughty “designed to rouse mom” poems than I care to share. Fortunately, burger king fries only taps out 4 syllables. The grandparents participated too and despite the torture, perhaps one day they’ll remember it as a way to celebrate National Poetry Month. Enjoy our haiku or near haiku. This not that is obscene. bam, toot, blast, ka boom. It’s National Poetry Month. Share Poetry! And yes, I’d take haiku over harlem shake. Any given time. In reality, me too. Although I do have one little shaker who would’ve been happier doing the dance. That one was actually mine Deb. Enjoy. Now if you offered the Alabama Shakes, it might have been a different evening. I definitely have something to learn, Bob. I’m learning to sneak it in! Sharing it on my FB page. Tammy, I’m taking this idea and running with it for my kids–though they’d probably choose to dance . . . Wonderful Kirsten! It’s intended as inspiration. Have fun dancing or doodling! What a wonderful idea! I think that I will sharpen my pencil now, too! Terrific! I hope that it inspired you to write a phrase or a verse and if it is in celebration of food – all the better! Hahahaha! How much do I love that choice? The eggplant one? Priceless. I do love a good haiku — so elegant, and yet so easy to write. The choice created a certain outcome. The eggplant verse, I have to live with! Must we consume turnip greens? Yet, why is it deserved? Amazing and fun. I love the one you wrote about the beans. All are delightful. Wish I had been there. I can just hear the conversations! Chop chop chop, could have been BH? Great haiku! You should check out Trevor at Sis.Boom.Blog! He does similar haiku about food. Not sure I would use the word enthusiasm to describe my kids’ participating! 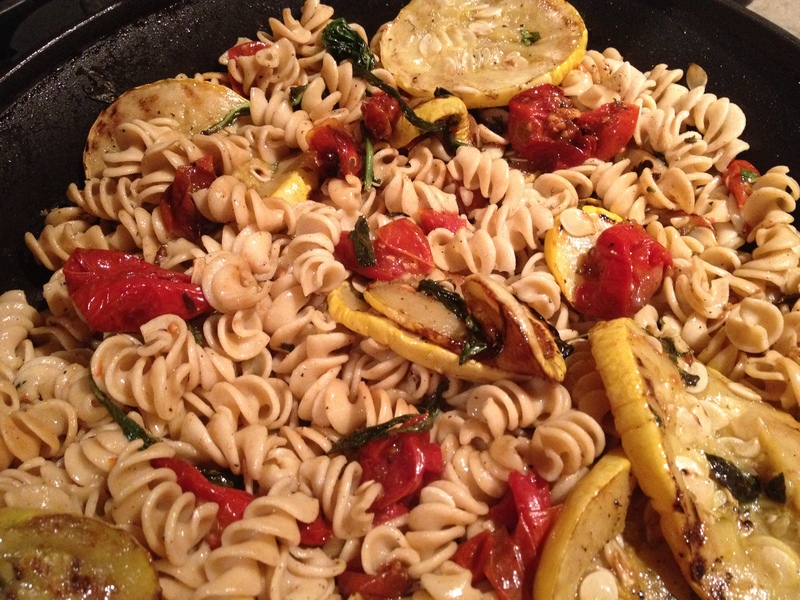 The pasta has yellow squash, cherry tomatoes and spinach with spice – love the simplicity. See if they recognize it. the cheese masks it all. it came from his heart. Awesome. If it weren’t Sunday morning, I might write a haiku. Instead I’ll just laugh and say refrigerator. Yes, that one was yours silly boy! That was my middle son’s who is quite the contrarian. Creative though. These are wonderful. Thank you. I’m still smiling at the effects of the beans. You’re so welcome. Food is a great way to encourage poetry. Ah, you just made me smile soooo hard! I love the snapshot of your parenting. So fun! My kids don’t love this snapshot of my parenting but someday, they will recall it fondly. Aw… I know you’re right;)! I have made a resolution to laugh daily and this had me in tears from chuckling… Ironically I start my writing class this week and now know where my focus will be. Thank you for sharing the love of writing! Enjoy the class. Let us know what you write. God bless. What a good and fun idea. 🙂 I´m sure the children will remember this with a smile. That is my hope. Nice to see you! I like the one ending in “refrigerator.” Congratulate the young lad responsible for that one! Yes, he was pretty pleased with himself. the eggplant one made me laugh. Those were funny! So much humor and wisdom packed into a few well-chosen words. definitely reflective of the personalities that scrawled them. do you haiku? Oh my gosh, love this idea! Have to remember it for when Jake is bigger! It’s great fun on vacation too!